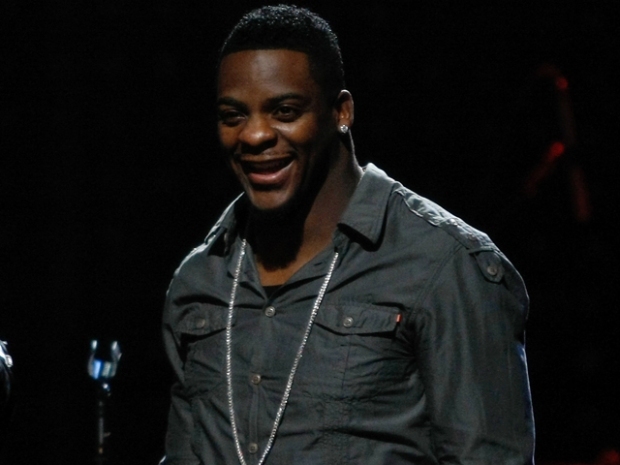 Redskinsrunning back Clinton Portis struck a pose on the catwalk Tuesday night. He hosted the 2009 Walk This Way charity fashion show. The rooftop of the Liaison Hotel (415 New Jersey Ave. N.W.) was packed with D.C. elite and pro athletes to benefit Becky's Fund, a nonprofit that aids victims of domestic violence. The organization was founded in 2006 by Becky Lee, an attorney specializing in working with victims dealing with domestic violence. Attendees enjoyed cocktails and hors d'oeuvres while mingling with the D.C. elite for Washington's first-ever over-the-pool runway. Models -- including Jason Campbell, DeAngelo Hall and Albert Haynesworth -- showcased apparel by Eric Finn Custom Clothiers. "The damage caused by domestic violence is too often overlooked. One in three women in America are victims; that’s one in three too many," Portis said. Clinton Portis and his Washington Redskins teammates modeled in a fashion show Tuesday night to benefit an anti-domestic violence group, Becky's Fund. While the ballers strutted their stuff, female models made statements while stomping down the catwalk. All proceeds from Walk This Way will go to Becky's Fund to aid victims of domestic violence. "Domestic violence is the number one cause of emergency room visits by women in the United States today. Yet we never talk about this issue unless it is about reacting to a tragedy,” said Lee, executive director of Becky's Fund. "Our community needs to be cognizant of the fact that unless we create a support network for these victims, they have very little options to leave."